To survive a tire blowout, pretend you're the bad guy in a police chase: Push the gas and drive straight ahead. The shotgun-blast noise of a tire blowout makes most law-abiding drivers do exactly the wrong thing: attempt to slow down quickly and get off the road. With a rear-tire failure, any turning at high speed will likely result in a crash. If you experience a blowout DO NOT immediately hit the brakes - use the accelerator to maintain control and allow the car to slow down to a safe speed before turning onto the shoulder. I've taught hundreds of drivers how to correctly handle a tire blowout: I sat in the passenger seat and exploded a gaping hole in the tire with plastic explosive. Not one lost control. Here's how they did it. · Squeeze the gas pedal for a couple of seconds. This puts you in control of the car and directs the car straight down the road. It also prevents you from committing the mortal sins of braking and turning. After a couple of seconds, gently and smoothly release the accelerator pedal. The drag force of a completely flat tire is so potent that pushing the gas will not allow the vehicle to go faster. · Most importantly, drive straight down your lane. Keep your feet away from the brake (or clutch). · Allow the car to coast down to as slow a speed as is safe (30 mph is good). Engage your turn signal and gently turn toward the shoulder of the road that's on the same side as the blown tire: This lessens your chance of losing control and will make the tire change safer. If the situation requires, you may ever so lightly squeeze the brakes. 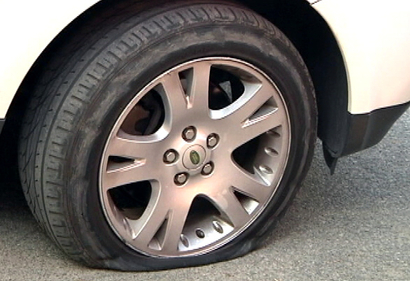 Almost all highway blowouts and tread separations occur with the car traveling in a straight line on a very hot day at high speeds with an underinflated tire. 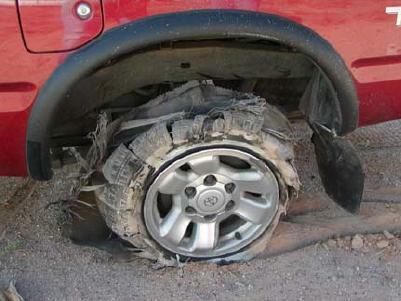 The repeated flexing of an underinflated tire causes the failure. Check your tire pressures! Though the recovery techniques are nearly identical, a tread separation is more dangerous than a blowout. This is where the tread rubber and underlying steel belt partially or completely come off the tire. This creates a giant Weed Eater with a blade of steel-backed rubber spinning around at about 1,000 rpm. It'll scythe through the fuel tank, brake lines, inner fender panels, rear seats, side windows and, of course, flesh and bone. An impending tread separation is usually announced by a consistent thumping noise, which will increase to a slapping sound, and then a metal-tearing jackhammer pounding. Sometimes this process takes days, other times only seconds. If you hear this, immediately slow down and take the tire to a professional for inspection. If you can see damage, put on the spare before proceeding. · Squeeze the gas pedal for an instant and gently release it. · Drive straight down your lane. · Allow the car to coast down as much as is safely possible. You will likely have to apply the brake slightly in order to reach a safe turning speed. · Engage your turn signal and smoothly turn toward the shoulder of the road that's on the same side as the damaged tire. Another reason why tread separations are more dangerous than blowouts: When the tread leaves the tire, the bad noise stops and some people think the car has magically cured itself. But instead of rolling along on grippy rubber, they're riding on fabric. Polyester will offer little grip when they take that next freeway off-ramp. Thanks to things like loose floor mats and a poorly placed race car throttle cable, I have experienced stuck throttles. Although this will be a rare occurrence for most drivers, if your engine starts racing away uncontrollably, it must be stopped immediately. · If the engine started racing when you pushed the brake, release the brake. If the engine stops racing, you were actually pushing the gas by mistake. · Put the transmission in Neutral (and/or push in the clutch). Don't worry about the engine when you shift into Neutral: Engine speed limiters on modern cars will prevent damage. And it's OK if you get Reverse: The engine will either stall or act as if it were in Neutral. · If you can't get Neutral, switch off the ignition as a last resort. Today's cars don't allow the key to turn to the locked position if the car is not in Park, and the car will be much harder to steer once the engine is off since the power-assist will not be working. Fortunately, with the engine off, there's still plenty of reserve braking power to stop the car. Of course, if the car is equipped with a newfangled keyless ignition, getting Neutral may be your only hope. If you're a passenger in this situation and the driver fails to act, you can reach over and put the car in Neutral or switch off the engine. But to have any hope of acting properly with a stuck throttle, both driver and passenger must practice first. Find a training partner and an empty parking lot. First practice with the car stopped, just to make sure you know the drill. Move the shift lever from Drive to Neutral. Then turn the key off. Next, restart the car and accelerate to no more than 10 mph, then push the gas pedal to the floor (to simulate a stuck throttle) and hold it there through the rest of the exercise. Immediately, put the car in Neutral and switch off the key. Repeat the process but with the passenger working the shifter and key while you're still in the driver seat. Then, swap seats and repeat. Know this: In every well-maintained modern car, the brakes will easily overpower the engine. If you're truly pushing the brakes as hard as you can, the car will stop even with the engine going full speed. The corrective actions for sudden acceleration and a stuck throttle are identical. Check the list above. Be sure to check out our other articles on Driving Tips as well! Come into Brighton Ford and see our great selection of safety award winning New Ford’s.